to our homeland make loyal.
" A learning society with balanced personality in the modern era "
" நவீன யுகத்தில் சமநிலை ஆளுமையுடைய கற்றல் சமூகம் "
" To provide opportunities for developing modern technologies and values with the help of educational, physical, and cultural resources "
" கல்வி, பௌதீக, கலாசார வளங்களின் உதவியுடன் நவீன தொழில்நுட்ப விருத்திக்கும் விழுமிய விருத்திக்குமான சந்தர்ப்பங்களை வழங்குதல் "
I took in charge of the college on the first of June 2012 from Fr. Jeevanadas Fernando OMI at the request of His Lordship Rev. 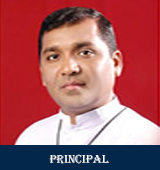 Dr. Kingsley Swampillai, the bishop of Trincomalee. The college is endowed with devoted staff. It is also assured by a dedicated team of OBA, Trincomalee Rev Fr. 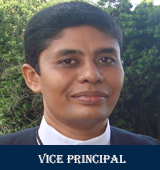 Noel Emmanuel the vicar foraene as its general secretary and Mr. S. Thevasahayam, former teacher and teacher centre manager, Trincomalee as the secretary of school development committee (SDC). Any plan we design and any effort launch involves man power and financial assistance for which the college depends on the past students and well wishers. Progress of any institution demands collaborative work. We humbly invite all who dream of the bright future of St. Joseph’s college, to join hands with us in the journey of the progress of our Alma Mater. This first Scout Troop in the District was formed at St. Joseph’s College, Trincomalee in the year 1920 and hence, is called the First Trinco Scout Troop. In the 83 year history of the college troop, many teachers have served as Group Scout Masters, contributing to the growth of the troop. Vestassapede et donec ut est liberos sus et eget sed eget. Vestassapede et donec ut est liberos sus et eget sed eget. Quisqueta habitur augue magnisl magna phasellus sagittitor ant curabiturpis. Vestassapede et donec ut est liberos sus et eget sed eget. Quisqueta habitur augue magnisl magna phasellus sagittitor ant.